Sign language is a language in its own right but it relies heavily on using the fingers to spell out words and phrases. British Sign Language is the main form of communication used by 50 000 deaf people in the UK. 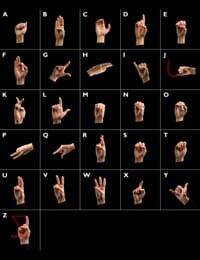 Sign language is commonly used by deaf people and those with serious hearing impairment. You might think that sign language is a universal way of communicating but it is not only countries that speak different languages that have different sign languages, there is also a British Sign Language and an American Sign Language, and these are very different. British Sign Language is the main form of communication used by 50 000 deaf people in the UK. It can be learned by anyone and many people who can hear take the time to attain the skills necessary in order to have good communication with people who are deaf. Sign language is a language in its own right but it relies heavily on using the fingers to spell out words and phrases. Very practiced sign language communicators do this very fast. The letter w, for example, is spelled by interlocking the fingers of the hand together and moving them inwards, to form a w-shape. Other signs indicate whole words – the word family is spelled out by holding the index and middle finger of one hand inside the other hand and moving both hands in around in a circle. Although sign language does use fingerspelling, the language has its own grammar and syntax and relies on many other signs such as facial expressions and body posture. The way the sign language is constructed can be very different, even if the spoken language is the same. American Sign Language is more similar in its syntax to Japanese than to English and someone who is deaf and communications using this form cannot be understood by someone who uses only British Sign Language. Sometimes, sign language has developed in a region and overcomes the barriers of different oral languages. In South Africa, for example, people speak a total of 11 different oral languages but all deaf people who use sign language use the same language. There are instances in which sign language is practiced by hearing people in situations where their sense of hearing provides them with no advantage. One area is in diving; divers have developed their own sign language to communicate with each other effectively when underwater. Stock brokers and bookies, who take bets of busy racecourses, have done the same thing. There are also a few rare examples of communities, such as the Yucatec Maya in Mexico and some areas of Ghana in which most people communicate preferentially using sign language rather than speech. Not surprisingly, these communities do not view deafness as any sort of disability of disadvantage. It could be argued that sign language pre-dates spoken language and may have been the earliest form of communication between ape-humanoids. It is certainly possible to teach the more intelligent apes such as chimps to communicate with humans using a sign language. The first formal system of sign language is thought to have been developed in Italy in the 1500s and the Frenchman Charles-Michel de l’ Épée was very important in establishing a widespread French sign language during the 1700s. Some experts think that the American Sign Language of today originated from this French sign language, which was taken over the America in the early 1800s. British Sign Language is a much more recent language due to a difficulty that is hard to explain. Until the last 20 years, the British establishment has actively discouraged the use of sign language for the deaf, preventing it being taught to deaf children. The reasons for this are unknown but seem to stem from the worry that signing makes people look stupid and ‘pantomime’ like. Thankfully, this is now changing and the British Sign Language is recognised as a real and complex language in its own right. Its greater uptake in schools and in organisations for the deaf means that it is now allowing deaf people to communicate with much greater freedom, not just relying on lip reading.